Children of Time opens with a rather neat concept. An obsessive scientist, Dr Avrana Kern, an excellent characterisation of the very definition of hubris, is seen at the culmination of her life’s work – about to release a colony of apes and a gene modifying nanovirus onto a terraformed planet. Her goal is to create a species of sentient ape and to collect data on their evolution and cultural development from a satellite in orbit. Clearly this is a universe in which ‘Planet of the Apes’ was never created otherwise she may have thought twice… However, a terrorist group who are opposed to such experimentation* target the experiment leading to the apes being destroyed, the nanovirus infecting a colony of insects and our arrogant professor trapped in the monitoring satellite slipping in and out of suspension as the centuries pass. What follows are two separate stories. In one we see the development of the insect cultures created by the virus, in particular the species of spider who form the dominant lifeform on the planet. They go from primitive creatures not too different from our own earthly spiders to establishing a complicated society with religion, social issues and technology. Each iteration of this story sees a new leap in evolution as the spiders learn new tricks, helped by the virus, and make attempts to commune with their ‘god’, the AI in the satellite which is set to find evidence of sentience. The other thread follows the last remnants of the human race, asleep in a generation ship called the Gilgamesh, travelling through the centuries in search of a new home. Here we have our hero, Holsten Mason, a mild mannered classicist – an academic who studies the ancients. Just as a modern day classicist would study the culture of the Romans or the ancient Greeks, Mason is an expert on the languages and cultures of the long dead culture who were capable of terraforming planets. The story set in the Gilgamesh is fairly standard SF fare. Generation ships, light years of travel, changes in the crew each time the PoV character comes out of suspension. There is very little here that has not been seen before, though I am enamoured of the concept of the equivalent of a modern day Latin master – an expert in the culture and language of a civilisation millennia old – being used to translate documents and transmissions that could be vital for humanity’s survival. Mason is an entertaining and sympathetic ‘everyman’ who interacts well with the other characters on the ship, being the unwitting participant in the mutinies and insane plans that happen around him as the others vie for power when all he really wants to do is carry out his studies and conduct his somewhat understated and pathos filled affair with the ship’s chief engineer. Where this book really shines, however, is in the wonderful treatment of the spider culture. Tchaikovsky clearly has a thing for insects, in particular spiders. You can tell that simply by reading the fantasy series, Shadows of the Apt, for which he is more well known. All of that Arachnophilia also comes out in this. Indeed, I did harbour suspicions that Children of Time could very well end up as a prequel to that series. When reading Shadows of the Apt I did sometimes wonder how a planet could be populated by races descended from insects and here is a plausible explanation. In the end, however, this seems to not be the case but you do have to wonder if the author was riffing off his previous ideas and trying to justify them in some way? Certain plot events make this idea less likely but it was still an entertaining thought for a while. Whether linked to the Apt books or not, the spider culture in this novel is fascinatingly established with a clear line of development from primitive savages to a modern culture that explores some modern societal issues in an interesting way. For example, gender equality is given a lot of time, which is understandable in a species where the females traditionally eat the males after mating, and there are debates about religion and the ethics of survival. These sections of the story have an unusual feel to them, being written from the PoV of characters who do not communicate via speech but rather via vibrations on webs and a complicated body language involving multiple limbs. This means little or no dialogue in the traditional sense and this adds a little edge of ‘uncanny valley’ to the feel of these parts of the story. The spider story could have faltered due to lack of characterisation. After all, each time we see them we are progressing several generations in their development. However, the author neatly avoids this by following set lineages of spider as they progress – the representative of each one being called the same name. So the story follows successive Portias, Biancas and the males that serve them which adds a false sense of continuity to the characters. This works well and allows the reader to gain a greater sense of empathy with the characters. 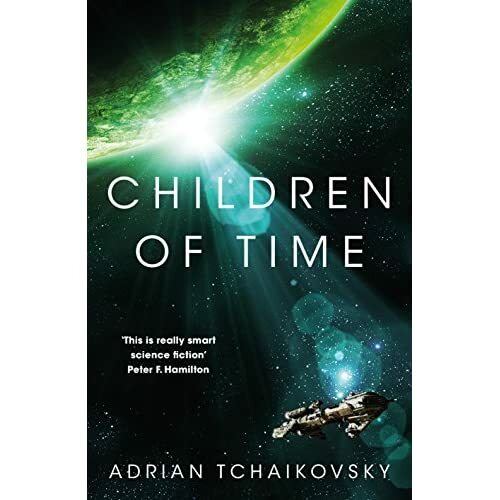 In all there is little not to like about Children of Time. It hits a number of SF concepts that have been revisited before but does so in an entertaining and novel way. Speaking as a biologist, the science aspects of the fiction are well represented and while on the edge of what may be possible, do not feel too far fetched with even the blatant deus ex device of the nanovirus to paper over any cracks in the evolutionary biology being not all that obvious. Definitely recommended. *Maybe they have seen Planet of the Apes?